Parasailing, a photo by aghrivaine on Flickr. The boat docks in Marina Del Ray at the Fisherman's Village, a little picturesque dockside cluster of restaurants, ice cream stands, and the like. We got there early on a brutally hot February day, but the boat ran quite late. We finally boarded about 45 minutes after we were due to leave. If you ever go, don't show up early, it's not worth it. Anyway we set out of the marina on a big speedboat, and they deployed the parasail, cheerfully pictured here. The whole process is very simple - you put on a harness that clips to your waist and hugs your legs at the thigh. You clip the harness to the parasail, and they pay out the drogue line, launching you into the sky. Then the boat tools around the Santa Monica Bay with the sail at about a 300 foot altitutde. There's no more wind than there is down on the boat, and it's very peaceful. However, when I went to jump school, we learned certain warning signs for imminent disaster, one of which was the sound of the chute flapping. That generally means a pane of your chute is mired in the guy lines, and you're falling too fast, probably fatally. On a military jump, you've got seconds to straighten it out or deploy your secondary, or your dead. 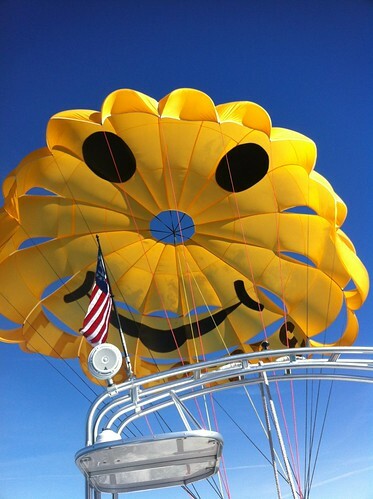 On a parasail, those little cut-outs exist so the chute doesn't drag TOO much, but they also flutter and make sounds just like a fouled 'chute. Although intellectually I understood that everything was fine, some mammalian instinct in me kept flopping around in my deep hind-brain and insisting I was about to fall 300 feet. I did get over it, and the ride was very enjoyable, but maybe I shouldn't have told Herself about the whole scary-sound thing until we got back on the boat. It was a great experience though, and I'd recommend it to anyone. Even if they play kind of annoying hip-hop music really loud on the boat.